It turns off men, basically. Now, you probably know this already. But it’s still a good story for the mainstream media. And the Washington Post is the latest to touch in on the female-to-male ratio of yoga practitioners in the West. (After all, as the Post notes, that fairly famous Yoga Journal survey in 2012 found that of 20.4 million yoga practitioners in the U.S., just 18% are men. Although the story isn’t explicitly tied to the Smithsonian’s yoga art exhibit, I’m going to assume that the opening last weekend is the implicit reason the Post published a fairly lengthy piece on this topic. Yoga on the brain, if you will. Why don’t men do yoga? Akula is like many women who do yoga and want their spouse or partner to give it a try. But the many myths about yoga stand in their way: Yoga isn’t a decent workout; it’s too touchy-feely; you have to be flexible to do it; men’s bodies just aren’t built for pretzellike poses. Fishman has written several books on using yoga as a supplement for rather than as a substitute for medicine. He has studied yoga since the early 1970s and noted that the practice was developed centuries ago by men in India. But its modern form has become feminized. When men say they are bored with yoga, Poole thinks there may be something else going on. “Our egos are deflated because we can’t do some of the poses,” he said. That’s a pretty common attitude among some men at the Flow Yoga Center in the District, according to co-owner Ian Mishalove. He suggests that men look for a beginner class, talk with the teacher beforehand about any past injuries or physical limitations, and don’t insist on trying to do every pose. The spiritual side of yoga can inspire some people, while it’s a New Age nightmare for others. That’s particularly true for many men, according to Mishalove. “If it’s flaky and too New Agey, soft or touchy-feely, that can be a turnoff unless it’s explained in a way that is understandable to a male audience,” he said. Mishalove says that men often respond better if yoga is presented as a way to relieve stress rather than a way to find spiritual contentment, for example. The piece ends, of course, the way approximately 89% of stories of this ilk do: With a guy saying he goes to yoga class because that’s where the women are. Of course. I won’t leave you on such a low note, though. U.S. News & World Report has the best rundown of the Smithsonian show that I’ve encountered. However, the exhibit also uncovers a dark side to how yoga inhabited the Indian imagination. “There’s definitely always a strand of evil, sinister yogis, at least in the imagination,” Diamond says. This includes paintings and illustrations of fictional yogis who doubled as spies, incinerated cities and engaged in other forms of taboo acts. “How can you show that kind of thing? Obviously, their scariness wouldn’t show if they were sculpted in the context of a temple. You have the trope of the sinister yogi in popular stories for two millennium,” Diamond says. Yes, the story kind of runs with the “sinister yogis” idea. Anything to get feet in the door. It still is the best description of the show I’ve seen. I think ashtanga has more appeal for men because of mysore style practice. Several men who started as beginners said they did not want to learn in a large, led class. The independence is appealing to everyone, but to men in particular. That makes sense — vs. the idea in the Post story of men not liking being in a big class where the women can do all the poses and they can’t. Does this mean Mysore allows one to “hide” to a certain extent? Both of those articles really bothered me. They were both sensationalist. I thought the second story nicely tied the “fear” of yogis to the British + advances in technology (at the time, photography, mostly). That struck me as seeming pretty believable. 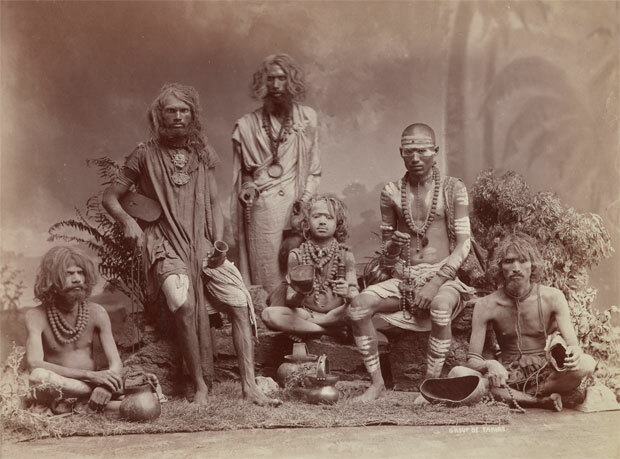 The photo really reminded me of the old photos of First Nations Peoples (Indians in America) in the late 1800’s depicting them as savages http://home.comcast.net/~zebrec/Chiefs.htm I’m sure yoga philosophy was counter intuitive to Imperialism and the level of violence the British laid upon yogis and the rest of the Indian people through starvation, torture, enslavement to control them. The yoga won out in the end though.